In many hours of doodling, I found that nested Stars of David make an interesting way of visualizing the musical octave. In particular, they’re a good way of visualizing the even divisions of the octave: as two sets of six notes (the two whole tone scales), as three sets of four notes (the three fully diminished seventh chords), and as four sets of three notes (the four augmented triads). In mathematical discussions of music it’s common to represent the octave as a clock face (see my previous post on that), and it’s common to visualize note sets as polygons inside the clock face. But when you try to represent the whole tone scales, diminished seventh chords, and augmented triads all at once, you get two overlapping hexagons combined with three overlapping squares, combined with four overlapping equilateral triangles: a tangled mess! It’s an interesting information design problem to try to represent all of those relationships clearly, in the same diagram. 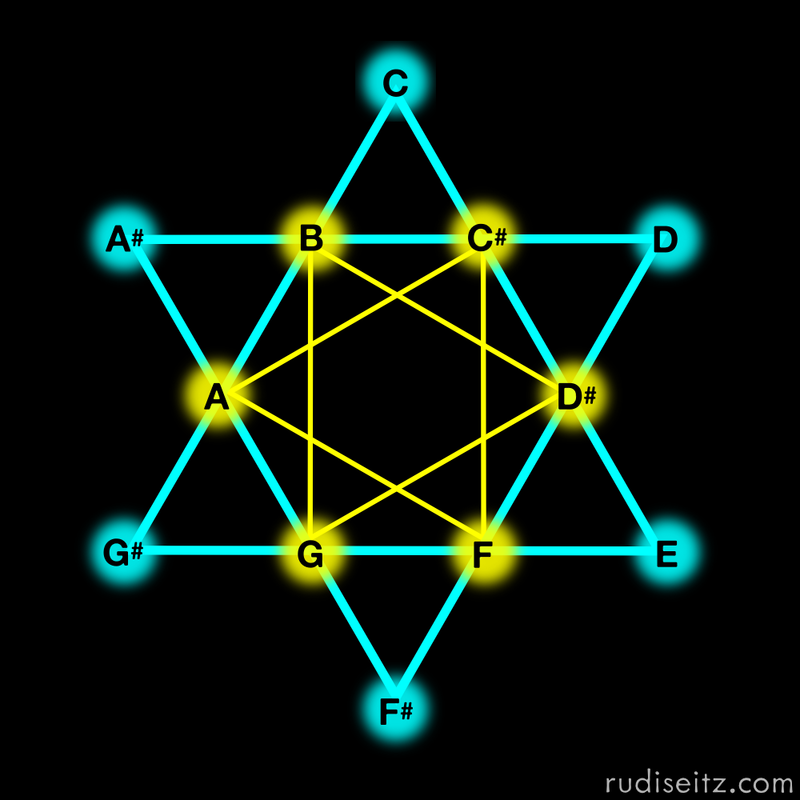 I think nested Stars of David do that in a very beautiful way. 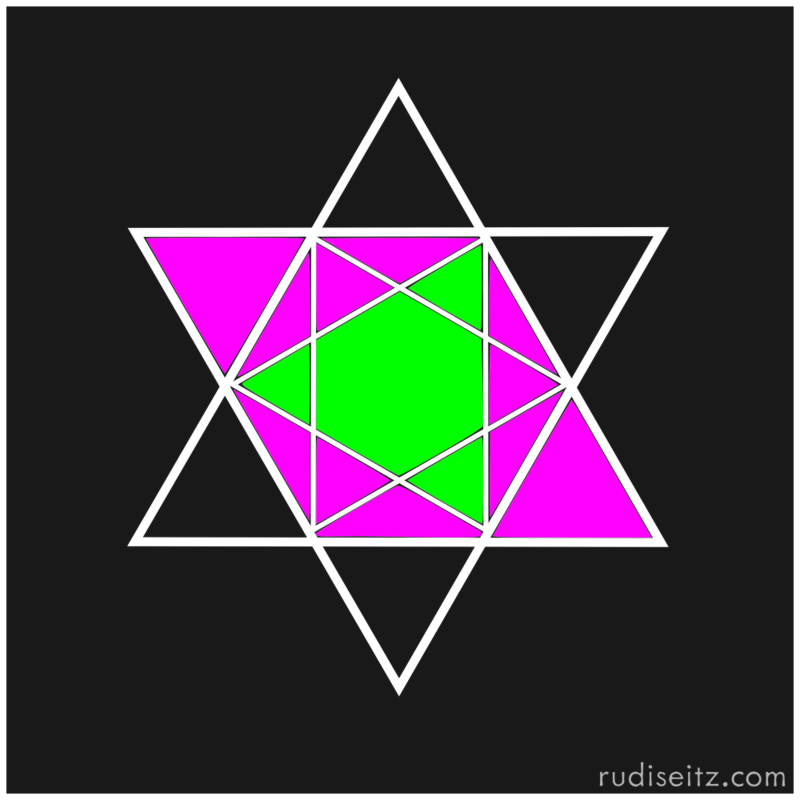 The idea is to place a note at each of the outer points of the Star of David, progressing clockwise, with C at the top; then draw another star inside the main star. 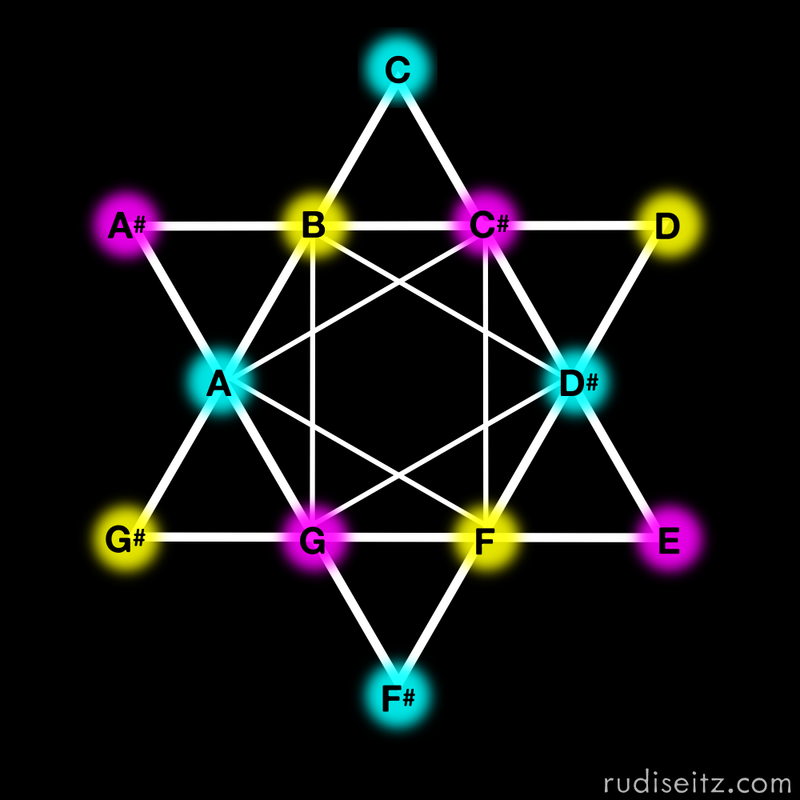 Each line segment on the outside of the larger star represents a half step between two notes, and each triangle edge represents a major third. Note that the coloring scheme is somewhat arbitrary–if you’re one of those people who has strong synaesthetic associations between notes and colors, these diagrams might be painful to look at (sorry!). For everyone else, hopefully they’ll be fun to check out. I enjoyed seeing how you color-coded all the chords, and auditory symmetry made visual is a great thing. Makes you realize how arbitrary it is to put the C up on top, and all other notes measured away from C.
However, there is something a little disturbing about your diagram. It makes me think that C, D, E, F#, G# and A# are somehow more important and special than your other six notes. It’s a huge break in the symmetry of the picture, and yet it has no justification in the theory presented. All this leads me to wonder … why is the major scale so hidden in your star? What about my old friend, C – E – G, the first chord I ever learned? She’s not one of your pretty pictures. In fact, it’s the lack of symmetry in our standard music that stands out to me after seeing your star. Also, I’ve heard that once upon a time, they used to tune instruments differently, so that there was not so much symmetry between the various keys. How would that relate to your picture? You could jiggle the position of the points so they are “tuned” differently, but what would that do to the resulting angles and chords? This also reminds me of the 12 signs of the zodiac. Cardinal, Mutable, and Fixed; Water, Air, Earth and Fire; Male and Female. All these aspects are equally spaced among the 12 signs creating some interesting combinations. Maybe you should also look into how astrologers go about displaying information too. And above all, thanks for sharing!! Thanks for the comments! When I first started with this diagram I was hoping to find a “definitive” visualization of the octave that I could use in my own music practice. What I realized is that any visualization has tradeoffs: it brings certain relationships to the forefront while de-emphasizing others. 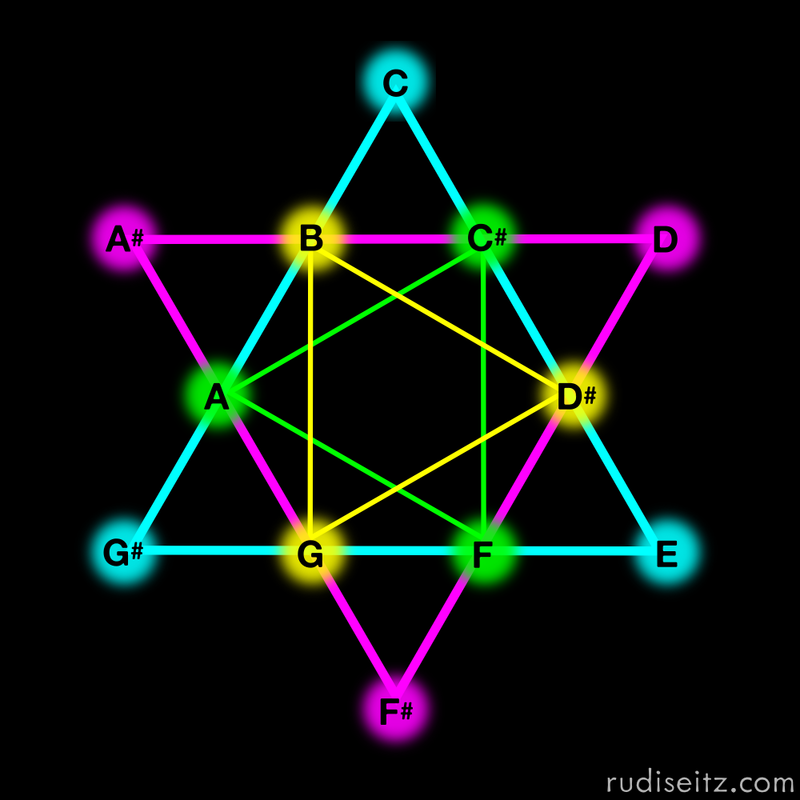 As I mentioned in the post, I think the Star is particularly good at showing the various ways of evenly dividing the octave: take away the the color coding and you can still see four triangles, three diamonds or rhombuses, and two “rings” of notes in the star, all at the same time. (Compare this to what would happen if you tried to draw those same shapes all together inside a clock-face representation of the octave.) Unfortunately the visual clarity of the star depends on the compromise you pointed out: six notes fall on the vertices of the big triangles, while the other six fall on the small triangles, which could suggest that the second group is somehow less important. When I look at the diagrams I choose to ignore this disparity because the diagrams show me other things that I find interesting. However, I’d love to know if someone can come up with a simple visualization of the number 12 that gives equal prominence to all the elements while still making it easy to see all possible divisions into groups of 2, 3, and 4. Can it be done? Familiar things like major and minor triads do make recognizable shapes in this diagram, but they don’t “pop out” because they are “asymmetric” when you consider them as ways of dividing the 12 notes of the octave. I think any explanation of why major triads and the major scale appeal to us has to take frequency relationships and how we perceive those relationships into account — you won’t find the “secret” in this sort of diagram because it doesn’t really encode any information about pitch ratios and psychoacoustics. However, if you look at how the major scale falls in this diagram, you might find that it has certain purely combinatorial properties that don’t necessarily explain why it appeals to us as listeners, but do shed light onto why it is a fertile basis for composition: why it lends itself to modulation and other devices that composers exploit. There is an area of research called “Diatonic set theory” that looks at this stuff. Thanks again for the comment — there’s lots more to say here — I’ll try to post more on this.